With some of the finest, most consistent ice in the world, the Canadian Rockies are home to a plethora of ice climbs with everything from beginner experiences to expert multi-pitch climbs. The ice climbing season is long, often starting as early as November and continuing well into April, particularly on the shaded north aspects. 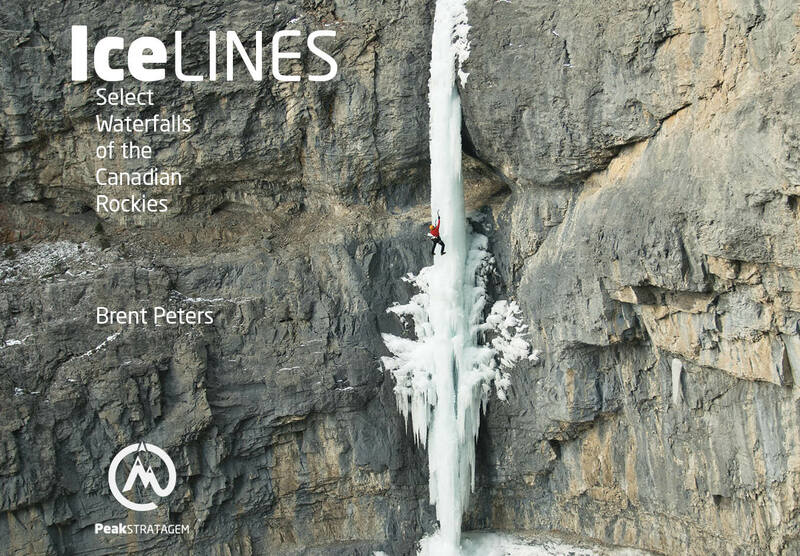 IceLines Select Waterfalls of the Canadian Rockies is an amazing guidebook with great photos is the perfect place to start planning your ice adventure. Written by PeakSTRATAGEM guide and owner, Brent Peters, the guide showcases the best climbs the Canadian Rockies have to offer. Feel free to contact us to find out what is in shape and best for your ability. PeakSTRATAGEM offers teaching, coaching and mentorship as well as guided experiences. If you want to learn to be independent, competent, and efficient, our guides are excited to share our skills and help you grow and refine your toolbox. Experience ice climbing for the first time! Modern equipment has made this sport easier to get into. 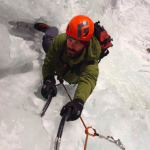 Our guides will show you how to use crampons and ice axes safely and effectively. Anyone with moderate physical fitness can achieve the impossible. 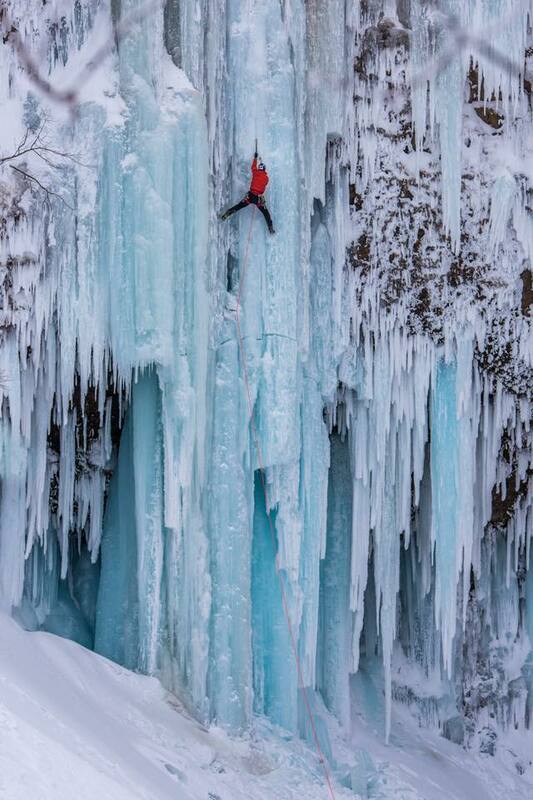 Let us help you unlock the mystery of climbing a frozen waterfall your first time. If you have climbed before, but want to improve your technique, one of our coaching days is the right choice for you. Whether you want to learn to lead, become more efficient, or climb steep pillars and stacked ice mushrooms, our guides will tailor our curriculum to your current skill level and help you break through to the next difficulty of climbing. Have a ticklist? Our guides are out in the terrain daily and know what routes are in the best condition and safe for the current avalanche conditions. Let our highly skilled ACMG certified guides take you to the top. The Canadian Rockies have plenty of routes for every skill level and we will find the right challenge for you. The Ghost River Wilderness Area is a special part of the Front Range of the Canadian Rockies. Comprised of Public Land Use Zones for access and Alberta Provincial Parks, this area is particularly wild and remote. The numerous river crossing that are usually required to gain access to the best climbs pose a particularly challenge. On a perfect day, your rental vehicle might make it in to the Ghost. Who knows if you will make it out? The river can change on an hourly basis as the ice dams and flows. Join our experienced Ghost guides in our lifted 4WD truck for an experience that is more than just climbing. Set yourself up for a successful winter with our Rampart Creek Ice Refresher from Dec 3-7 2018. Our expert guides will hone in your skills to ensure you are climbing safely and efficiently from the start of the season. Day 1 and 2 are designed to be instructional cragging days focused on everything from ice climbing basics, to steep ice technique, to lead climbing efficiency. Days 3-5 are designed to be smaller 3 person teams to accomplish objectives on the Parkway. These are offered both as guided or as coached days, where you can implement the skills from the beginning of the week. Evenings are spent enjoying the camaraderie of climbers and great food around the dinner table at the Rampart Creek Hostel. If you’d prefer, you can take advantage of our infrastructure to explore the Ghost yourself with our self guided, self catered options. A two day course designed for those with no previous waterfall ice climbing experience, including rock climbers and mountaineers. You will learn how to use the equipment, the foundations of ice climbing movement, and the basics of top rope climbing applied to waterfall ice including anchor building using ice screws and v-threads, and rappelling. A two day course teaching the basics of leading waterfall ice. It is designed for those who are confident top roping WI3-4 waterfall ice and who want to progress to lead climbing. You will learn how to prepare for a lead climb, placement of ice screws for protection, the NoFall program, mock leading, and rappelling from a v-thread. A two day course teaching the basics of multipitch climbing on waterfall ice. It is designed for those who are confident lead climbing WI3-4 waterfall ice and who want to progress to longer waterfalls. You will learn the multipitch system including belaying a second, rope management, transitions, route selection, and multiple rappel descents. Steep Ice Technique is a two day course teaching advanced ice climbing movement and how to find the best protection. It is designed for those who are confident climbing WI4 and want to develop that same confidence on steeper waterfalls. You will learn the techniques required to safely and efficiently climb vertical to overhanging ice features.